With many of us spending hours a day looking at computer displays, eye strain is a real problem for many. This is particularly true late at night or early in the morning when we tend to view these screens in low light situations. If the screen is to bright or has too much blue, it can cause eye strain. To combat this, developers have rolled out a feature named Night Light. Night Light essentially filters out the blue light in a display, turning it a warm sepia color, which reduces eye strain. While Google has introduced this in Android, up until recently it wasn’t even an option in Chrome OS. The feature made its way into the beta builds of Chrome 60 back in September but it wasn’t until Chrome 62 that it made it to the Stable channel. Now, in Chrome 63, you still have to enable it manually to make it an option that is available to you on your Chromebook. In this How To, I’ll show you where to find it and how to enable Night Light on your Chromebook. I’ll also show you how to configure it to where it automatically turns on at a particular time each day. First, in order for you to have the Night Light option on your Chromebook, you have to enable the feature in flags. To get to the flags in Chrome, type chrome://flags in the omnibar and it will take you to the flags page. I should warn you that there are a lot of settings in flags and for the most part, you shouldn’t mess with them. Some of these can make your system unstable as they are experimental – just as the Night Light setting is today even though there is a flag for it in the current Chrome OS builds. If you experience any weirdness with your system after you enable the flag, I’d recommend disabling it. I personally have it running on three Chromebooks (On Chrome 62 and 63 depending on the device) with no issues. Once you are in flags, the best thing to do is press Ctrl+F and search for “Night”. Once you find it, click the hyperlink and set it to enable. Doing this will require that you restart your Chromebook so the setting can take effect. Now that you have the flag set to enable, you can go into Settings on your Chromebook and enable function. Go into Settings and go to Displays. At the bottom you will now find the settings for Night Light. Here you can configure the feature to be enabled at sunrise and sunset or you can set a specific time for it to come on and turn off each day. You can also adjust the warmth of the display to your liking using the slider. 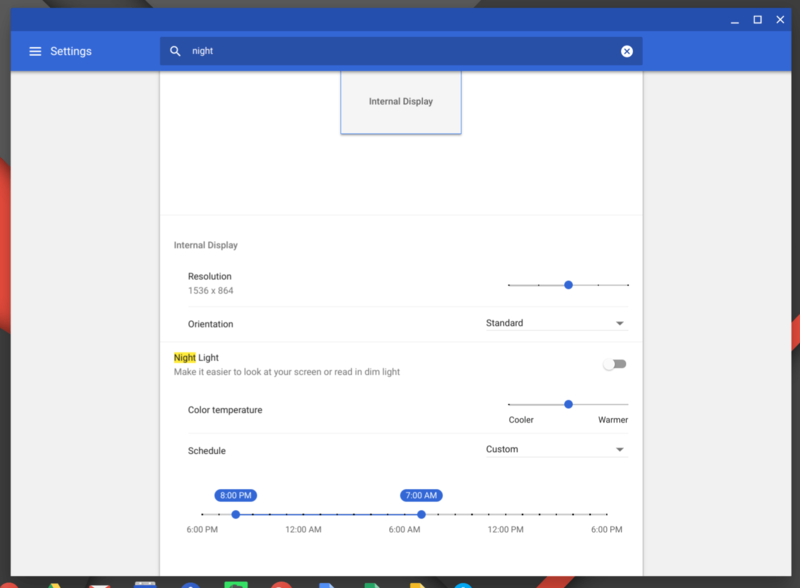 Finally, if you want to override your settings and enable Night Light at any time, you can do so from the System tray on your Chromebook (where your profile picture is, battery indicator, etc.). After you enable the flag, you will note a new moon icon when you open up the tray. Click it will turn on the feature immediately. To turn it off, just click it again. For more How To’s, head over to the Tips & Tricks pages.